What happens when the public’s need for coffee and the dedication of a committed staff overflows an incubation space? You get a bigger cup. Bello Mundo Café, sandwiched between Boo Boo Records and HumanKind on Monterey Street, is doing just that. After four years in its beloved, compact location, the café’s moving into a larger space two doors down. WE’RE MOVING: Bello Mundo Café is moving two doors down to 974 Monterey St., a location eight times bigger than its home for the past four years. 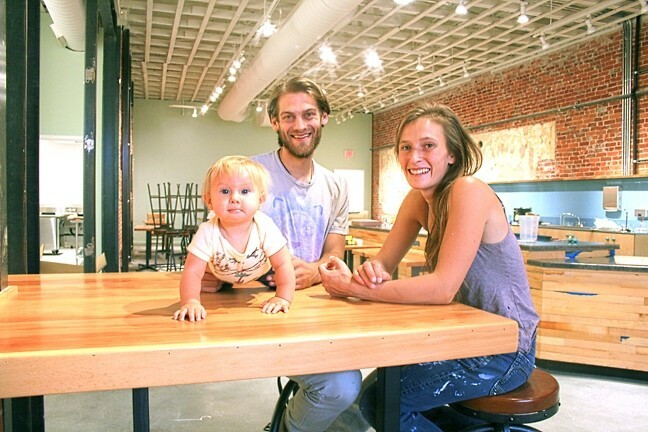 Owner Jonathan Stauf (pictured with his family) said the space will include ample seating for its many patrons, more wall space for local artists, a pour-over coffee and tea bar, and more. That small space supported an area focused primarily on cultivating community. For the many regulars of the café, the expansion means there’s a lot to be excited about. Transformation of the new space, most recently occupied by clothing company Wet Seal, will include more seating, a full bakery and kitchen, a study bar, Wi-Fi, more wall space for local artists to display their work, and bathrooms for customers. Of the many things Stauf is excited about, having a larger kitchen is at the top of the list. Despite its previously tight quarters, Bello Mundo has always baked everything from scratch—except for the croissants, which are sourced from the local Back Porch Bakery. That includes pressing the café’s own almond milk and shaving chocolate for drinks. “It took a lot of love and commitment to do all those things from scratch in such a small space,” Stauf said. The seating options also expanded from three indoor tables to what seems like a forest of chairs and tables within the 2,800 square feet the coffee purveyor will soon be filling. “The design here is to preserve the main room as a community space where people can talk and get to know one another and also where people can pop out laptops and be in their own little bubble,” Stauf said. Stauf’s goal is to appeal to the large demographic of his customers, including high school and college students, city officials, and countless community members. For Stauf, one of the most exciting new ingredients of the space will be an experimental trial with a team profit-sharing model. A quarter of his monthly profits will be put on the table and returned to the employees based on their contribution to the business. He notes this model is an attempt to take care of the people who are really helping build the strong community that’s been formed within the café. His dedicated staff and community members are also helping build the new café space. Good friends built all the furniture, including the study bar and tables made from Douglas fir that was reclaimed from a nearby circa-1906 house. The bar was built with sheeting made from an old gymnasium floor. His staff and those who are inspired by his vision have been tirelessly helping to open the new space. What is this vision? “Community first and coffee a close second,” Stauf said with a smile. Not only was it important to stay within San Luis Obispo, but Stauf also wanted to stay within the block they were already enveloped in, maintaining strong ties with its small business neighbors. The expansion excitement is overflowing in their vicinity—HumanKind will be expanding into the space recently vacated by Bello Mundo. The grand re-opening for HumanKind will be Oct. 10. As of press time, Bello Mundo is hoping to be fully open by Thursday, Sept. 17, in their new location at 974 Monterey St. The community is welcome Sept. 21 from 4:30 to 6:30 p.m. for a ribbon cutting of CIO Solutions, a local tech company, opening a new office at 864 Osos St.